Little Common Football Club was left cursing two big refereeing decisions following a home defeat yesterday (Saturday). 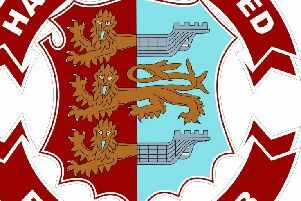 The Commoners lost 3-1 at home to Lancing and dropped a place to third-from-bottom of the Southern Combination League Premier Division - one position above the relegation zone. But Common were convinced a throw-in was wrongly given against them in the build-up to Lancing’s second goal and that they should’ve been awarded a penalty shortly before the visitors’ third - two decisions which could have made a difference to the final outcome. The reverse fixture between these two sides in late September produced a remarkable 12 goals, with Lancing winning 8-4, and another high scoring affair looked to be on the cards as both netted in the opening nine minutes. Lancing struck first in the sixth minute. Michael Death’s free kick from the away left was headed home by the unmarked Noah Dudok Van Heel at the far post. Common levelled three minutes later. Lewis Hole controlled Russell Eldridge’s ball over the top on his chest before hitting a shot on the turn which bobbled its way past away goalkeeper Ben Purkis. Common defender Lewis Parsons was whiskers away from getting his head to an Eldridge corner when well placed in front of goal shortly before Lancing went 2-1 up in controversial fashion in the 30th minute. Home goalkeeper Matt Cruttwell allowed the ball to go out of play in Common’s right-back area following a delivery across the box, fully expecting Common to be awarded the throw-in. 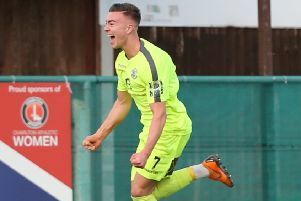 The referee gave it the other way, though, and Lancing took advantage of Common’s disorganisation in the immediate aftermath to work their way into the box before Matthew Daniel drove low into the net. Common’s vehement protests proved in vain. Daniel had another chance later in the half, but this time didn’t properly get hold of his shot after Finlay Pittock burst into the box. At the other end, Ryan Alexander couldn’t quite get his head to another Eldridge free kick. Common had a great opportunity to equalise early in the second period, but Eldridge’s free kick was headed wide by Jamie Crone. There was more controversy in the 67th minute. Ellis, who looked a threat with his pace and direct running, got on the end of Wes Tate’s ball over the top just before the outrushing Purkis and seemed to be taken down as he poked it past the goalkeeper. It looked a clear penalty, but the referee and his assistant didn’t agree, and to rub salt in the Common wound, Lancing went 3-1 ahead two minutes later. Daniel netted his second with a neat finish which went in via the inside of the post. Common, kicking into a by now strengthening breeze, kept plugging away and made three substitutions in an effort to get back into the match, but Lancing seemed to have things pretty well under control and Daniel lobbed over when well placed to complete his hat-trick. The Commoners probably ought to have pulled one back in the 90th minute, but Nick Richardson fired just over after Hole had won a good flick when challenged by the goalkeeper. Common: Cruttwell; Greig (Paul), Parsons, Alexander, Feakins; Tate, Ward (Smith), Eldridge; Crone (Richardson), Hole, Ellis. Southern Combination League Premier Division bottom six (played-points): 15 Langney Wanderers 33-34 (-26 goal difference), 16 Loxwood 33-27 (-30), 17 Arundel 33-24 (-42), 18 LITTLE COMMON 33-23 (-35), 19 Eastbourne United AFC 32-21 (-46), 20 Shoreham 33-21 (-46).